FAKE estate is an artist­-run initiative based in brisbane, australia. we are committed to exhibiting new and experimental work of early career emerging visual artists from both brisbane and wider Australia­. FAKE estate holds a keen interest in exhibiting interstate artists within brisbane as a means of broadening networks and diversifying the local art community. FAKE estate aims to provide a platform for emerging visual artists to develop their creative practice and to present work to new audiences. As an artist-run initiative, we are invested in delivering a diverse range of exhibitions and public programs, such as group discussions, artist’s talks and written publications, which provide opportunities for the collaboration between artists, writers and academics. 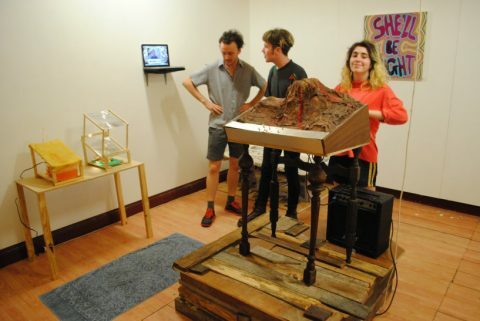 Llewellyn Millhouse, Callum Galletly and Sarah Poulgrain with artwork by (L-R) Sarah Poulgrain & Llewelyn Millhouse, Callum Galletly, Hamish Hill and Yannick Blattner at Don’t Look So Offended by Fake Estate ARI at Witchmeat ARI, November 2013. Photo by Madeleine Stack.